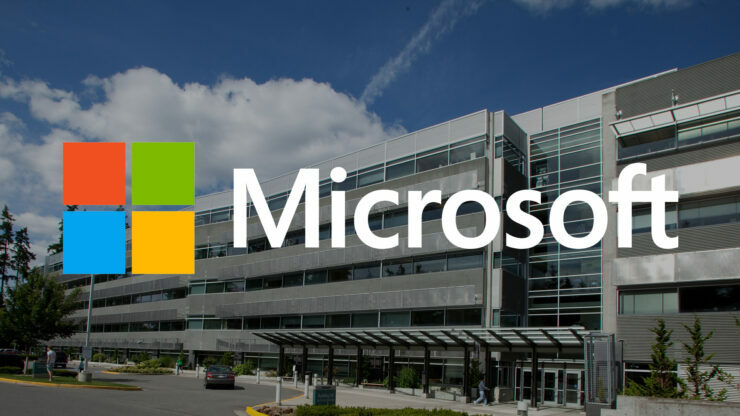 Microsoft (NASDAQ:MSFT) has delivered their results for the three months ending December 31, 2018, and it seems the quarter was fairly good to the tech giant. Microsoft raked in revenue of $32.5 billion and net income of $10.3 billion in Q2, a 12 percent year on year increase for revenue and 18 percent increase for income. Earnings per share were $1.10, slightly above the $1.09 per share analysts were expecting. Overall, it was a steady quarter largely in line with predictions, and Microsoft stock has climbed around 3 percent as a result. As has been the case for the last several quarters, Microsoft’s Intelligent Cloud division was a major highlight, although growth has leveled off somewhat. Intelligent Cloud revenue was $9.4 billion, driven by a 76 percent year-on-year increase in Azure business, which is exactly the same amount Azure grew last quarter. Of course, a 76 percent increase in business is certainly nothing to sniff at, but some see it as evidence that Azure’s period of wild, exponential growth is over. Maybe it is, but don’t buy into any alarmist stories about the cloud bubble bursting just yet. Surface sales were one of the highlights of Microsoft’s Q2, which isn’t something the company has been able to say for a while. Surface revenue was up a hearty 39 percent year on year, largely due to the release of the new Surface Pro 6, Surface Laptop2, and Surface Headphones in October. It will be interesting to see if Surface continues to be a bright spot, or if this was just a short-term holiday surge. Microsoft’s Xbox gaming division also managed to continue the roll it kicked off last quarter. Gaming revenue was up 8 percent year on year, but that doesn’t tell the whole story, as Microsoft got a short-term boost by launching the Xbox One X in Q2 2018. The more meaningful stat is software and services revenue, which was up a healthy 31 percent this quarter. According to Microsoft that increase was largely driven by Xbox Game Pass, and the continued success of Fortnite and Minecraft. 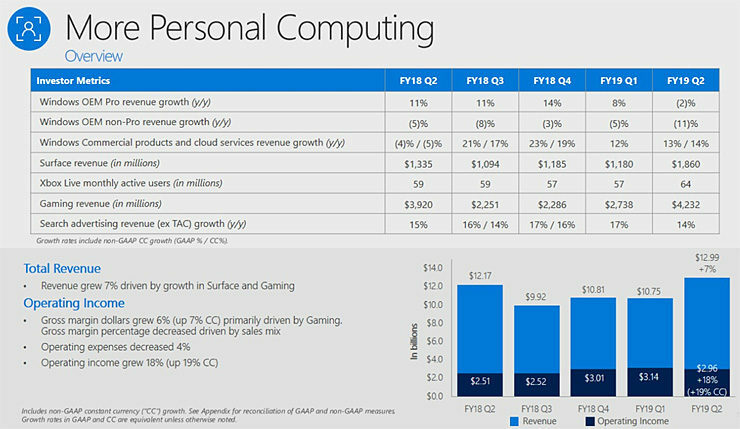 Overall, this was Microsoft’s best quarter in terms of gaming revenue ever, and the company expects services like Xbox Game Pass, Xbox Live, and the upcoming xCloud streaming service, which enters public trials this year, to continue to drive growth. The one significant blemish on Microsoft’s spreadsheet was dependable old Windows, with OEM Pro revenue down 5 percent and non-Pro revenue down a worrying 11 percent. Microsoft blamed this on a general downturn in PC sales and competition in the “entry level” computer category – basically, people are buying Chromebooks instead of traditional Windows-powered PCs. Microsoft CFO Amy Hood also hinted that the timing of certain new chips was also cutting into the sales of PCs and Windows. Microsoft’s outlook for the rest of 2019 is slightly conservative, with the company expecting between $29.4 billion and $30.1 billion in revenue in Q3. Overall though, you can expect Microsoft to continue to be Microsoft – which is to say, a reliable money-printing machine.